In the PRoF-consortium we always start with a brainwave session, where all our partners brainstorm together to generate ideas for our concepts. This typically results in 1000+ post-its with ideas. Next the post-its are converted into keywords which are input of the creative team to come up with a concept, which is presented and validated by the consortium. The final phase is building the concept: all companies join forces to realise the concepts and create innovative solutions for the problems encountered during the construction phase. 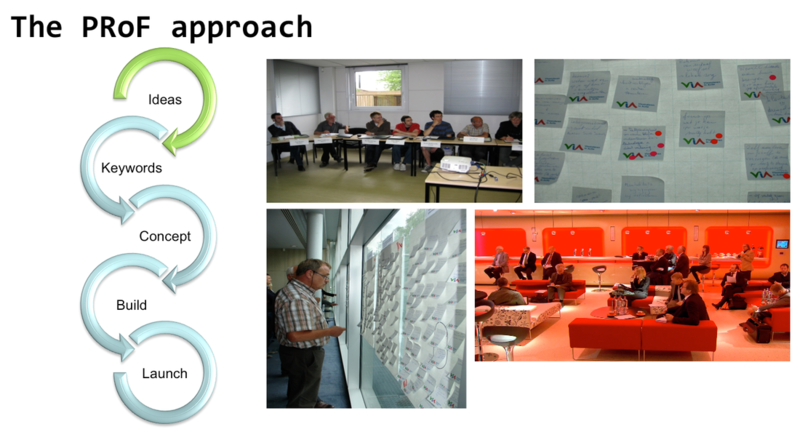 The last step in this process is the launch event when the concepts are being shown to the stakeholders and the press. These concepts remain at the PRoF-site and can be visited upon request. Awareness implies that sick, disabled or elderly people should have a good feeling about the concept or solution offered by PRoF. When people feel better, they recover faster and feel happier in their environment. It is important to bring a feeling of safety to patients and elderly people as they are in a vulnerable situation when in hospitals and other care situations. Privacy is used to indicate that personal privacy and cocooning are critical. Creating a homely feeling in hospitals and other healthcare institutions is key in PRoF.
Recognizing that elderly persons are increasingly lonely in modern societies, guided PRoF to design solutions to avoid the feeling of “loneliness”. Technically a product can be perfect but people may be ashamed or humiliated when they have to use it; wheelchairs and walking racks were cases in point. For the PRoF 2.0 brainwave, 90% of the consortium members said they personally would want inter-generational solutions as they grew older; almost nobody wanted to live together only with other elderly people. Hospitals, healthcare facilities, and elderly houses should use the space in a flexible way. Stays in hospitals become shorter (most surgeries take only one day stays), and chronically ill patients are cared for in specialised care facilities.